There are many local cruise specialists all over the world, with sites cropping up constantly, so many that it can become a bit of a blur. 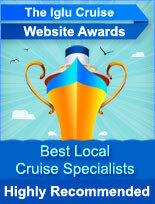 This award has been given to the best specialist websites, providing the best information to those who seek it. They provide a service to many tourists who would like to experience the best of which local cruise specialists have to offer. Our panel have proposed a list of the most influential sites, which provide an excellent resource to those who would like to experience what the local cruise companies have to offer, as well as providing important information and advice. Such sites meet the needs of various places all over the world, and are all different in their own way.